Kampung Pandan, Malaysia. Marching imperiously with a puffed-out chest and soldier’s ramrod posture, Mohamad Hatta Yahaya’s tiny chicken strutted its rich yellow plumage for a stone-faced judge. 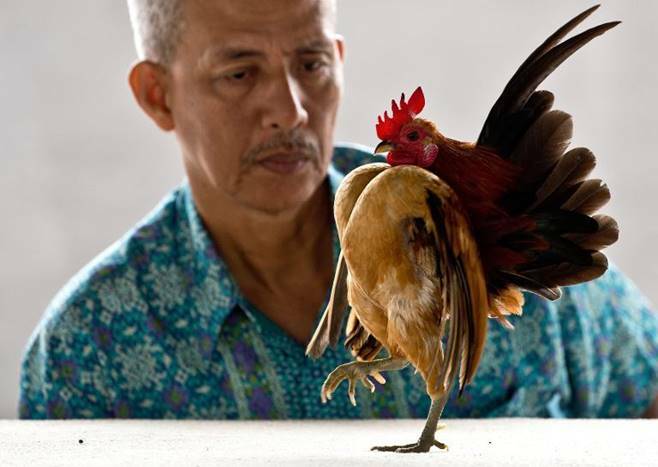 “Yes my hero, puff out your chest!” Mohamad Hatta cried out above the din of fellow fowl-owners as his $10,000 bird pranced to victory in a “beauty contest” for serama chickens outside the capital Kuala Lumpur. The breed — among the world’s smallest chickens with adults weighing less than 500 grams — has been a favored pet in its native Malaysia for decades. But its popularity has spread to as far as Europe and America, with enthusiast clubs proliferating as owners celebrate the decorative breed’s distinctive characteristics. These include attractive and richly coloured plumage and a unique bearing marked by a protruding, heart-shaped chest and wings that hang straight to the ground, giving the pigeon-sized bird the air of a goose-stepping soldier on military parade. While the Asian bird-flu outbreaks of recent times and subsequent poultry restrictions have hamstrung breeding efforts, the serama has been sustained by the efforts of ardent enthusiasts who will pay up to several thousand dollars for a prize bird. “There are people who want to buy my bird. But I am not selling it. It is part of my family,” Mohamad Hatta said. Believed to be a cross between the Malaysian wild fowl and Japanese bantam, the serama first emerged decades ago as a decorative pet for Malaysia’s state sultans before gaining a broader public following beginning in the 1980s. Its name is thought to derive from “Rama” — a term referring to Thailand’s royalty. Some believe the breed originated as a long-ago gift from a Thai king to a Malaysian sultan. Many Malaysians eat serama, believing them an aphrodisiac that also fights asthma. But the bird’s attractiveness and good-natured, manageable disposition has pushed it up the pecking order of Malaysian pets. Ahmad Fauzi Mohamed, president of the Malaysia branch of the World Serama Federation, estimates there are about 250,000 serama in Malaysia. There are nearly as many overseas, he said, and serama clubs have sprouted across Southeast Asia, the United States, Canada, Belgium, Holland, South Korea and elsewhere. The world federation has a membership of 35,000 and is growing by 10 percent per year. But Malaysia remains the serama heartland and contests are held almost weekly. About 200 people turned out at an open-air community hall just outside Kuala Lumpur for a recent contest as driving tropical rain thundered down outside. Lifting the diminutive competitors onto viewing tables, judges scored contestants on posture, feather quality, colour and temperament. Hours of grooming precede shows, including embellishing plumage with additional feathers taped to the bird — which is allowed. Oils are applied to enhance the sheen of plumage that can range widely in one bird from red to white to black. A 2004 regional bird-flu outbreak gave breeders a scare, as the Malaysian government culled hundreds of serama along with other fowl to contain the contagion, though there were no reports of flu-infected serama. “Many owners hid their birds in the jungle, trying to save the species,” said Ahmad Fauzi. Subsequent poultry import restrictions in the region have hampered breeding and trade, forcing many enthusiasts to smuggle Malaysian chicks and eggs, as the country’s serama are considered high-quality, he said. But demand continues to outstrip supply, and champions can fetch up to $10,000.